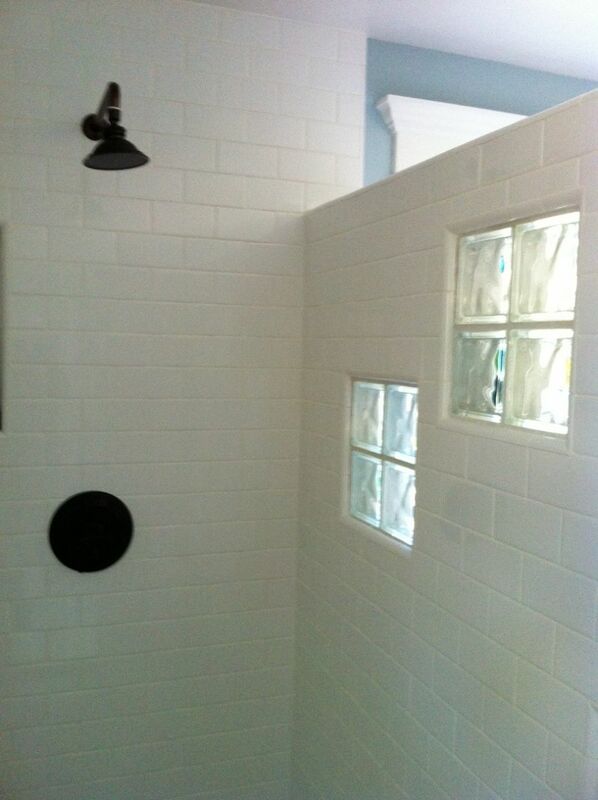 When Stephanie (who lives outside of Sacramento California area) looked at her old bathroom the word “outdated” screamed out– an old drop in tub, 4” x 4” white tiles and a flimsy brass finished framed shower said 80’s all the way! When the old shower started to leak it created the tipping point for a newly remodeled space. As Stephanie said, “I really wanted a fresh look, more light, and to combine both traditional and contemporary elements in the same space.” Learn below the product selections used to transform a California bathroom from outdated to stylishly updated. 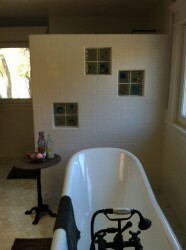 Cast iron pedestal tub – Nothing quite says traditional elegance like a cast iron tub. This 5 ½ foot “Tahoe” tub from a company called “Sign of the Crab” (interesting name – no I have no idea how they came up with it!) has 7” faucet holes and can be equipped with multiple finishes on the tub legs (including chrome, nickel, matte nickel, polished brass and white). For the plumbing fixture Stephanie used an oil rubbed bronze finish for the classic look. 3” x 6” ceramic subway tile – Subway tiles are not only a hot and fresh look for today’s bathroom but they exemplify the clean and tailored look of a classic space. These 3” x 6” white ceramic tiles from DalTile create an early 20th century style (the subway tile actually got it’s name from their use in the New York Subway system in 1904) which is simple and easy to clean. Carrara hexagon floor tiles – Carrara tiles (originally quarried from the city of Carrara near Tuscany Italy) provides a sophisticated look which harkens back to the Renaissance period (in fact Michaelangelo made his famous David sculpture from carrara marble). This tile has brilliant white, blue and gray accents – sophisticated and cool at the same time! Oil rubbed bronze fixtures – Again – working with the traditional theme Stephanie chose oil rubbed bronze shower fixtures from Kingston Brass. While oil rubbed bronze is not the least expensive choice, it is durable, easy to clean and won’t show water spots or fingerprints. 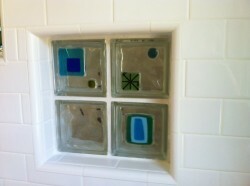 Decorative fused glass tile blocks – Who said you can’t have fun in a bathroom! 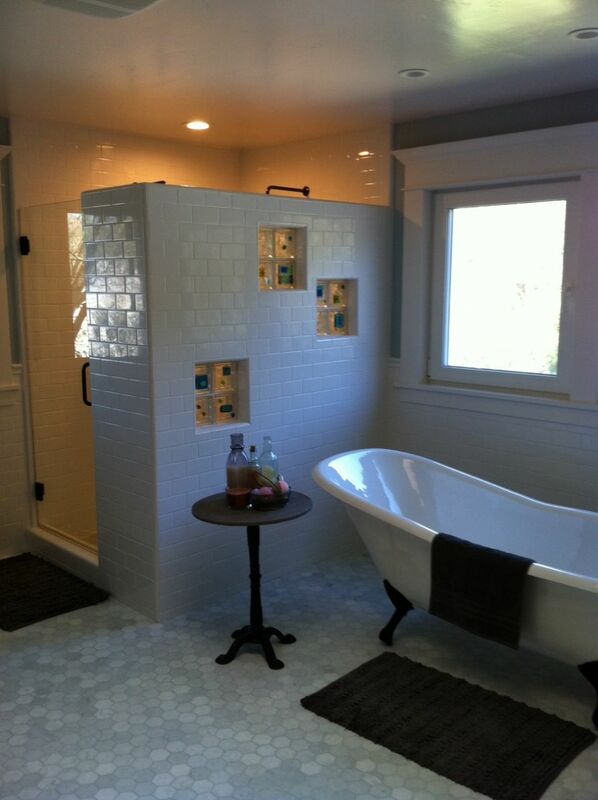 After searching on Houzz (an expansive site for home remodeling, design pictures and advice) Stephanie got the idea of adding an artsy touch with decorative glass tile blocks from Innovate Building Solutions. 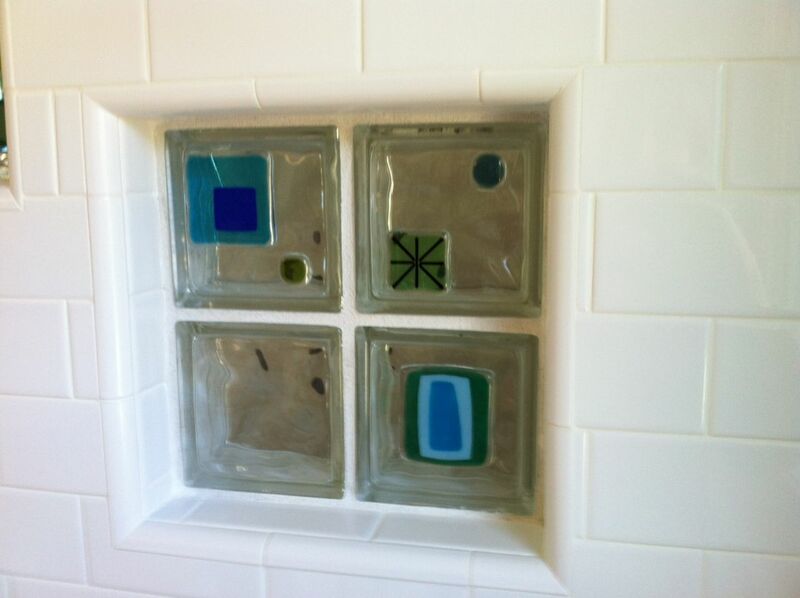 These artist-inspired tiles are fused to glass blocks with custom colors and designs. 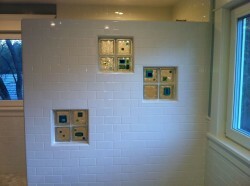 In this particular project the tiles picked up on the blue bathroom walls and gray from the tile floors. Clear frameless shower door – The framed brass shower door and enclosure system in the old bathroom was flimsy, difficult to clean and just tired. The new frameless shower door is now sleek, sturdy (1/2” thick), easy to clean (with no tracks at the bottom) and provides an unobstructed view into the new shower. When I asked Stephanie if she would do anything different in this remodel she simply said, “I love everything about it!” What do you think about combining traditional and contemporary products in a bathroom? Would you love it or lose it? Please comment below. If you’re interested in bathroom remodeling in the Sacramento and Granite Bay California call Doug Futrell (the contractor who built this project at 916-719-0818). 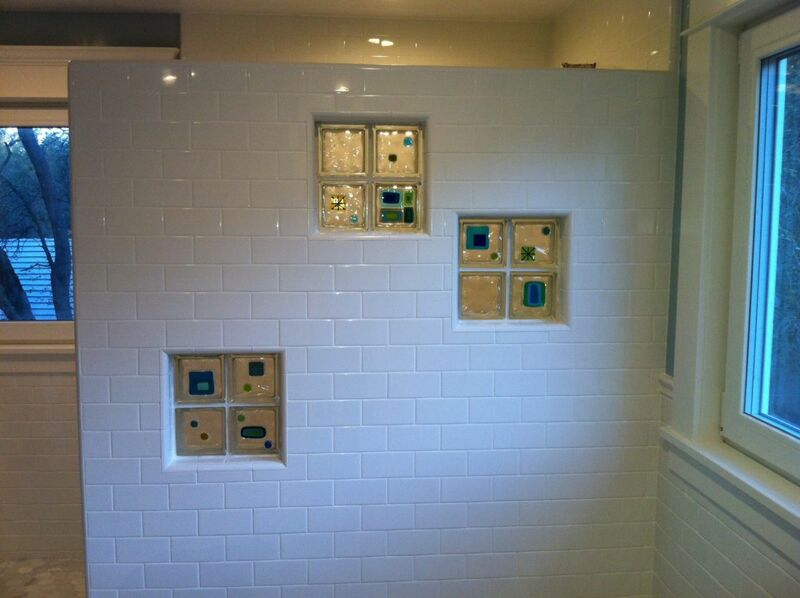 To learn more about glass tile blocks by calling Innovate Building Solutions (877-668-5888). If you are in the need of bathroom remodeling in Northeast Ohio call Cleveland Design & Remodeling (216-658-1270).